I have seen many credible writers write that Derek Jeter always says the right thing. Until a couple days ago, the writers were dead on. Media trained? Of course. He gives smart answers, and then dodges anything that he think might create a stir. You can't break the "Jeter Aura." But when I saw Rick Reilly's Q&A with Jeter a couple days ago, one back-and-forth popped out at me. Me (Reilly): Peyton Manning changed teams this season after 14 seasons with one team. Could you see yourself doing that? Talk about candor. He's 100 percent correct. When I started this Yankees blog as a clueless freshman at Quinnipiac, I hoped it would take me to the show. I wanted to cover the Yankees professionally. For my first couple of years, it almost felt like I was one of the beats – posting multiple times each day – but without clubhouse access, of course. Well, I'm not their next beat writer, and I'm not sure if I even want to do that anymore. But I will be covering the Yankees, along with all of the other New York sports teams, as an online sports editor/producer for the New York Daily News. I graduated four months ago, and I couldn't be happier with my first full-time job in the real world. This, my friends, is why radio shows are now televised. The polarizing sports talk radio host Mike Francesa nodded off while interviewing WFAN's Yankees beat reporter Sweeny Murti today. Make sure you watch him wake up at 0:53 (or see the GIF below). If only, if only, Francesa had stayed asleep through Murti's response. "Mike? Mike? You there?" We already knew John Sterling could shake. Tonight, we learned he could twist (and see the baseball when it's flying right at him), too. 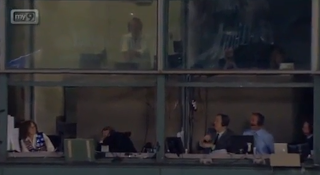 In this video, you'll see Cody Ross foul off a pitch toward the Yankees' broadcasting booths. While Suzyn Waldman and the YES Network gang kept their cool, this must have seemed like a heat-seeking missile to Mr. Sterling. But if you keep listening, the real treat awaits you at the end, when David Cone mocks Mr. Sterling's legendary home run calls. Coney, once again, proves his brilliance.